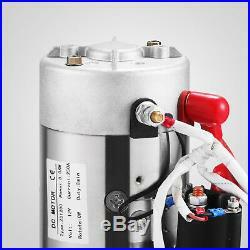 Double Acting Hydraulic Pump 12V Dump Trailer Metal Reservoir For Dump Trailer. The hydraulic power unit consists of high pressure gear pump, dc motor, multi-purpse integrated block, all kinds of hydraulic valve, fuel tanks and other components co. Is a organnic combination, is a typical power up, power down the hydraulic circuit. The second relief valve system realize the control of the downward pressure, pressure compensated flow valve automatically to falling speed adjustment. This product is widely used in small dump truck, hydraulic winch. 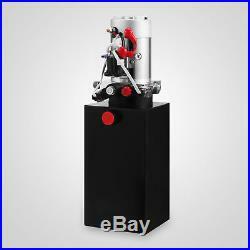 This power unit is suitable for control of a set of double-acting cylinder. Widely used in small dump truck, hydraulic winch, etc. This unit comes standard in many dump trailers and It is a direct replacement for most power-up/gravity-down applications. Its high quality starter ensure long life and a fast starting each time. The motor is built to last, and the tank has been specifically designed to not crack & leak under harsh conditions. According to hydraulic principle diagrams, with clean connecting hydraulic powe unit and oil cylinder tubing. According to the motor and the power of the electromagnetic valve marked characteristics ac, dc voltage is properly connected. Inching motor observe any abnormal phenomenon. In actuators, without load, start the electric, short run test, check whether all the parts run smooothly, determine and correct after loading step by step to normal operation. 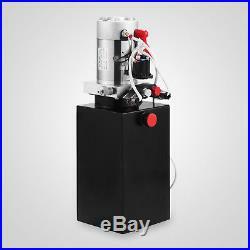 The factory production of a hydraulic power unit when leaving the factory, the system pressure has been set. If you want to change, the user according to the actual situation on their own through the knob to adjust the system pressure regualting valve, but no more than nominal pressure of the system. Carefully check the motor and the electromagnetic valve connection. In the installation and debugging for the first time, we must keep the internal fuel tank oil level, after a work cycle, oil tank should be made up, but not be too full. Electrical and electromagnetic valve connection should pay special attention to the supply characteristics ac, dc voltage and has the same sign. Ac power motor shell must be reliable grounding, forbidden ground operation. The motor terminal box note waterprrof, moistureproof. Connection for the first time, inching motor check direction, from the motor back end, spin to counterclockwise. Absolutely forbidden motor reverse reverse rotation and oil-free idling. When the gas tank hydraulic oil must be filtered, filtration precision is not lower than 25 microns. 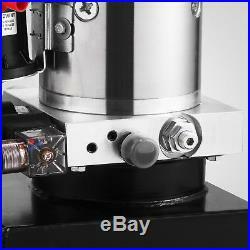 Power unit can't filter the impurities inside the hydraulic cylinder. So the hydraulic cylinder internal must clean. Tubing must also be clean. We must keep the actuators, and pipeline cleaning, prevent dirt from entering the system. We must keep the tank oil level, after a work cycle, proper fill oil. 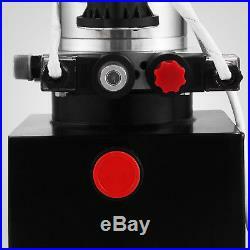 Such as pump suction air will cause the damage of pump and the damage of the seal. 100 hours after the running of hydraulic oil for the first time to join, change the new oil. After a year(1500 hours) to replace a new oil. 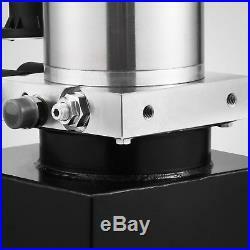 Hydraulic iol viscosity for 22 and 46 was commonly/s. Working environment temperature high use hydraulic oil of high viscosity, low working environment with low viscosity hydraulic oil. Perfect for Dump Trailers-Lift Gates! 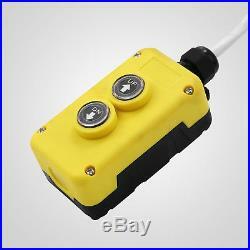 Perfect replacement pump for 12VDC controlled hydraulic systems. Fluid choice determined by operating environment/temperature. 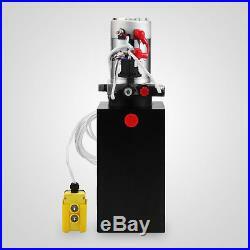 Displacement of hydraulic pump: 0.825GPM(1.1ML/R, Appliable to all single power unit for 4 6, 8, 10 quart). 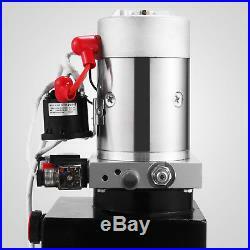 Pressure relief valve: 22MPA 3200 PSI Max. Relief Setting For Increased Lifting Power on A port. 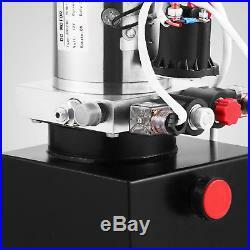 Motor power: 0.8--3KW(Appliable to all single power unit for 4, 6, 8, 10 quart). 1500 PS Max Relief Setting on B port. SAE # 1 Port, Horizonal mount. Hand held pendant with about 15 foot(4.5m)removal cord and start solenoid. 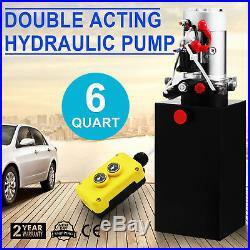 1×6 Quart Double Acting Hydraulic Pump. As a leading and emerging company in manufactory and exporting business, we are specialized in Business and Industrial Products, Sporting Goods, Pet Products, Home and Garden products for more than 10 years. We believe that it is our vision and mission to provide innovative products with best service and competitive price to satisfy you. A: The item ships from Rancho Cucamonga, CA, United States. A: Please log on your account. Q: How do I return an item? Please contact our customer service before you return an item. The item "6 Quart Double Acting Hydraulic Pump Dump Trailer 12V Unloading Power Unit" is in sale since Thursday, November 29, 2018. This item is in the category "Business & Industrial\Hydraulics, Pneumatics, Pumps & Plumbing\Pumps & Pump Accessories\Hydraulic Pumps". 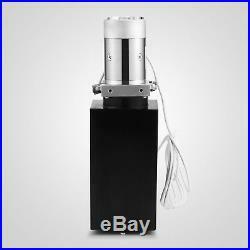 The seller is "technology-zoom" and is located in Ontario, California. This item can be shipped to United States, all countries in Europe, Canada, Mexico, Australia.